A sensual poster by the celebrated Canadian illustrator Vince McIndoe ca. 1979. 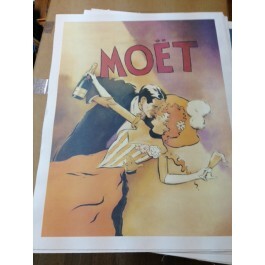 This stylish couple, dressed in Belle Époque attire, shows us how to have fun while drinking great champagne. Moët et Chandon is one of the world´s largest champagne producers and a prominent champagne house. The company holds a Royal Warrant to supply champagne to Elizabeth II. Moët et Chandon was established in 1743 by Claude Moët, and annually produces approximately 26,000,000 bottles of champagne.